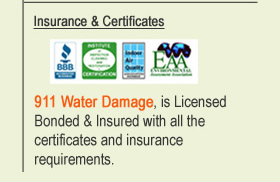 As professional and certified technicians at 911 Water Damage, our job is to minimize the damage by prompt and thorough action that will bring your contents and structure as close to pre-flooding condition as is humanly possible. With our ultra-modern techniques, it is possible to restore water damaged carpets, contents and structural materials to pre-flood appearance or better, because our professional restorers will be leaving the area freshly cleaned as well as dry. 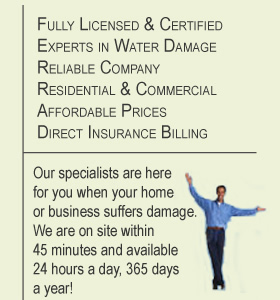 Time is of the essence in a water damage situation. Prompt action lessens the cost. It is advantageous to begin the drying process within 24 hours to prevent the growth of mold and other contaminates. If you wait too long, damage from moisture, humidity, and flooding will compromise the structural integrity of your home, weakening floors, walls and ceilings. Lingering water will leave an odor and may result in mold infestation, which in turn results in health issues. This problem becomes much more significant when dealing with a crawl space or basement in the house, as water will find their way to the lower levels. Our Certified Technicians are on call 24/7, equipped with fully loaded emergency units, ready to handle all type of jobs any time of the day without the need to get more parts or tools. We will arrive within 45 minutes to start immediately with water extraction, to enable dry out of the affected area and avoid further damage. Once water damage cleanup is complete, we will gladly assist with the restoration process, and if required we will provide pack out services.